When we Praise the divine qualities in us shine (Deva). Notice how we feel inside, in our inner environment when we praise and when we criticize. Say, "You are so sweet, so loving, so beautiful...." and feel those qualities sprout within you. Praising itself is a divine quality. We can only recognize divine qualities in others, because they are present in us. We cannot recognize something that we can't identify with within. So often I say to a person praising me, this praise is a reflection of you! When we criticize with emotion and intensity, "You have such a big ego! You are such an angry, hateful person!!" Then feel those same emotions burst within you. This is a brilliant design by the divine knowing the mechanics of Praise and Criticism. You become what you praise. Praise and criticism reflect a truth about a person. When someone criticizes you don’t take it personally. It often reflects what they are, not you. However; you must use a wisdom filter to objectively siphon what criticism you can take constructively. On the flip side, don’t let praise go to your head, know that those qualities belong to the divine, not something that your ego owns. The biggest virtue is humility. Therefore offer all the praise that comes to you to the divine. Or perhaps you have low self-esteem, and know your dark side, the demons within, and are too hard on yourself. Don't some of us feel that way? But it should not be so. There is a time to face the inner demons and vanquish them, and there is a time to accept praise. Sometimes it's very hard for us to be praise. That is also subtle form of ego. Let us be simple and natural like a child. Always accept yourself as you are, embrace with love those uncomfortable feelings that come up. The degree to which you have loved and accepted yourself as you are, to that degree will you be unshaken by praise and criticism. When we praise people, nature, God, those divine qualities come to life in us. So we should praise daily. That's why we have the rituals of prayer. Prayers, pujas, rituals, are meant to purify us. It creates a sacred environment within and without. Let people praise you, know that it is good for them, because it is kindling those qualities in them. So recognize those qualities in them. Praise or be praised! Why are half of our world's scriptures full of praise for the divine? 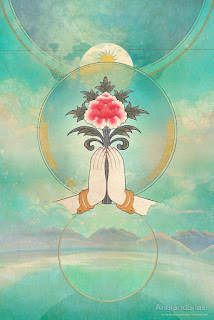 Not just praise but beautiful, poetic, prayerful praise; as a divine offering - Anjali. I feel that half the Veds are full of divine songs of praise, Devi Suktam, Sri Suktam, Narayana Suktam, Purusha Suktam (my favorite), and so on. Translation: This great Purusha, brilliant as the sun, which is beyond all darkness, I know him in my heart. Who knows the Purusha thus, attains immortality in this very birth. I know of no other way to salvation. From the various Suktams, to Stotrams, Panchakams, Shatakams, Ashtakams, to Stutis galore, the Lord has been praised. Translation: Krishna who is known as Govinda is the Supreme Personality of Godhead. He has an eternal blissful spiritual body. He is the origin of all. He has no other origin and He is the prime cause of all causes. I worship Govinda, the primeval cosmic Being. Brahma sang this Stuti to Narayan at the beginning of creation, after emerging from His navel. This is one of my favorite Stutis. Then there are the Lalita Sahasranama (1008 names), Vishnu Sahasranamas - full of brilliant praise, devotion, prayer, offered to the Lord as an Anjali. The sacred sounds and songs that have originated from the deep transcendental state of the creator, when sung, generate the same state in the one who sings them. These are set in the rhythm of the natural meditative breath. The rhythm of sacred sounds takes one into deep meditation and higher states of consciousness. The songs support this experience. I was told by more than one clairvoyant that my role and gift is to help people experience consciousness through meditation on these sacred sounds. At the substratum of our existence is consciousness. From consciousness comes vibrations, from vibrations - subtle divine light, from light - matter. As our body is matter and of this three dimensional reality, this subtle light is part of our subtle higher dimensional existence, vibrations are subtler and closer to consciousness which is the subtlest. Ancient meditators tapped deep into their consciousness and experienced these lights, sounds and vibrations. They then formed hymns and chants that would create the resonance of these vibrations within, because vibrations are the link to consciousness, and brings one closer to the experience of consciousness. It is the vibrations of the chants that is more important than the meaning. That is why the Vedic practitioners were so strict about learning and pronouncing Mantras in the correct rhythm. In 1984-1985, Dr. Peter Gariaev, the Russian biophysicist, and his team of Russian linguists were studying DNA and the ways light and sound vibrations communicate with what is today termed as “junk” DNA. Scientists have found only 10% of our DNA producing proteins, and could not figure out what the other 90% of our DNA does, therefore terming it as “junk”. Well nature doesn’t create junk. Now new research is finding out the role of this DNA. The syntax and semantics of these genes are similar to the way human languages are designed, and also that it responds to precisely focused vibrational patterns of human languages. You can converse with your body (i.e. your genetic material) via vibrations and waves that can heal ailments, fine tune your health, control body functions, etc. without the need of any physical intervention like surgery or medicinal drugs. The experiments by Peter Garjajev, and his colleagues, about the vibrational behavior of our DNA has proven that DNA responds to extremely focused light and sound vibrations at particular frequencies and hence can be instructed to perform tasks or exchange information accordingly. That is why the extremely precise vibrations from the chanting of Vedic Mantras and the light from the fire ritual (Yagya), was performed. It was for creating health at the cellular DNA level. In one of their experiments, the Russian scientists were able to beam the genetic patterns of salamander embryos onto frog embryos and thereby instructed the DNA of frog embryos to convert itself into salamander embryos. And they did! Without any physical intervention, or surgery, or drugs, not even touching – by just beaming genetic patterns the scientists were able to convert frog embryos into salamander embryos. Their research has led to many groundbreaking and paradigm-shifting discoveries with one of them showing that DNA is able to absorb and emit vibrations, which spirals along the double helix in sacred geometrical form. Literally, DNA creates magnetized wormholes in the time-space fabric. DNA acts as "tunnel connections between entirely different areas in the universe through which information can be transmitted outside of space and time. The DNA attracts these bits of information and passes them on to our consciousness.” The researchers found that with the presence of light (photons) at a certain vibration, DNA activation and thus evolution can occur. It is this DNA activation that takes us to the next level of evolution. Vibrations therefore effect our evolution to the next level of physical and spiritual ascension through DNA activation. From vibrations came matter. The effect of vibrations on matter can be seen through the experiments of Cymatics. In this process, vibrations of different frequencies are passed though particles, or liquid, which forms perfect symmetrical patterns. The patterns change as the frequency changes. The symmetry and geometric forms that we see in nature have therefore been formed from the subtle vibrations as the basis. What is interesting is that the geometric shapes formed by different frequencies are very similar to the Yantras, or sacred geometry, of the Vedic and other ancient traditions. The vibrations from singing and chanting also create these patterns in our cells which are mostly water, bringing harmony. Sounding at a particular frequency, e.g. “Om”, would have the same effect on cells which are not tuned well, as dropping a pebble on a disturbed surface of water, which would then bring harmonious ripples. Each object has a resonance, each human being has their own unique soul signature, so does each planet, and so on. When you are in the presence of an evolved being, your soul starts resonating with theirs, and you feel vibrationally elevated. It is like two tuning forks, when one is struck the other starts resonating at the same frequency. Each object a person wears for a while carries their vibrations. The places where spiritual practices or events happen carry a higher vibration in its subtle space. In locations where a person or people have attained liberation the transcendental vibrations stay for ages. Such become the places of pilgrimage. If you have become aware of your own subtle body you can feel these subtle vibrations from other people and places. In Bharat (India) there are many places which are pregnant with these sweet, divine, transcendental vibrations. Thanks dear Alka! :) <3 Glad you like it.